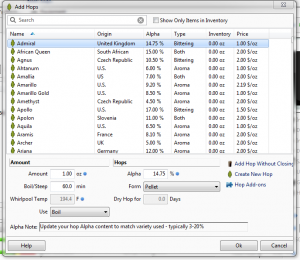 This page outlines the major new features for beer, mead, wine and cider you will find in BeerSmith 3 software. You can also check out the detailed BeerSmith 3 release notes here. BeerSmith 3 is the first major release and paid upgrade in 7 years. 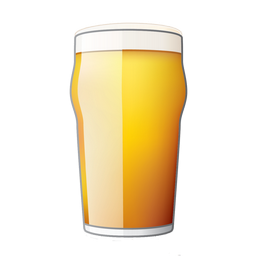 BeerSmith 3 has a familiar feel as it is not a complete rewrite, but has been updated in significant ways for beer brewers as well as those looking to add mead wine or cider. You can run BeerSmith 3 side-by-side with your existing BeerSmith 2 installation and see if its right for you. There is a BeerSmith 2 importer that checks for your BeerSmith 2 data and will import and merge it if you like when you start BeerSmith 3. You can learn about licensing options, upgrades for recent BeerSmith purchasers and upgrade options here. A streamlined and updated user interface that hides unused fields and customizes views and reports to the task at hand. Support for Mead, Wine and Cider (and Beer) including hundreds of new ingredients, new styles and tools for making these beverages. Support for juices, fruits and honey in any beverage including beer. The water profile tool and mash pH adjustment features are now fully integrated into the recipe builder so you can manage your water profile as well as water salts and mash adjustments right in your recipe. Folders in the cloud and more cloud space for most users making it easy to organize, backup, share and use your data online. A secure connection to the cloud for both desktop and mobile to protect your brewing data and recipes. I gave BeerSmith 3 a facelift. Some users found BeerSmith 2 to be daunting, because it showed everything all the time. 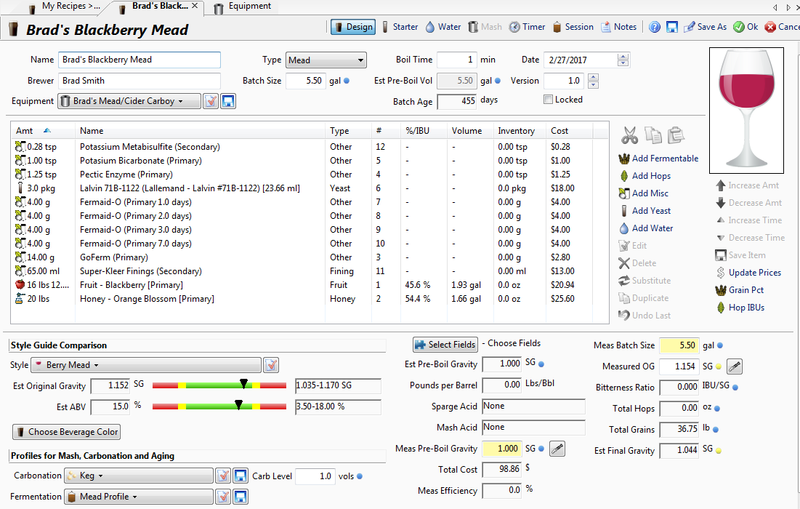 For example you might see all grain features highlighted when creating a simple equipment profile for extract brewing. So I made the dialogs and screens dynamic now. For example the dialog to the right is for a mead equipment profile. It shows just the options you would expect – basic volumes for starting the mead, fermentation losses, final volume and notes. If I changed the type to Extract, it would show me the additional boil options for making an extract beer. This approach is carried throughout the program, so when you add a new fruit or juice, you are simply asked the brix (sugar) content and a few other fields and not a bunch of stuff about dry grain fine yield (applicable for grains). On all of the dialogs, you see material that is relevant to your type of beverage and not a bunch of extra stuff. 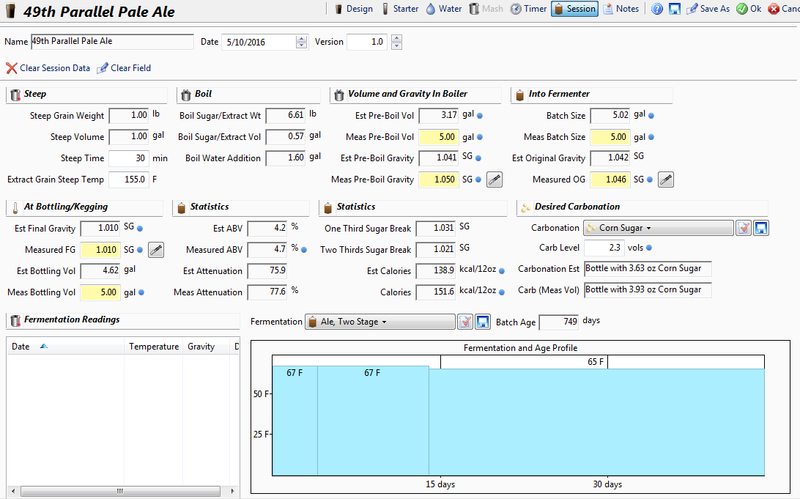 Even the brew day reports are now customized for the type of beverage you are working with. We also reorganized the entire program making hard to find features more accessible. For example you can download an add-on or create a new ingredient while you are building a recipe right from the “add ingredient” dialog. Add-ons are filterable by type so it is much easier to manage them. The new version of BeerSmith supports mead, wine and cider recipe types in the same way that it supports all-grain, extract and partial mash beer recipe types making BeerSmith an all-in-one solution. Just open up a new recipe, select “mead” (for example) and start adding honey, fruit, yeast and nutrients. The style guides are included for beer, mead, wine and cider. Many hundreds of new ingredients were added to support these including juices, fruits, honey varieties, misc ingredients, fermentables, and much more. 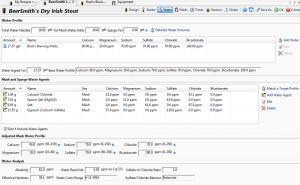 Equipment profiles, fermentation profiles and dozens of new calculations were added to support these recipe types, including stand-alone and integrated tools for things like sulfite levels in wine and mead, mead nutrient calculations and backsweetening. Honey, juice and wine are now native fermentable ingredients which means you can use them in your beer recipe as well. To add grape juice or honey all you need to know is its sugar content (Brix level) or drop a hydrometer in and enter the specific gravity. BeerSmith can estimate and use volumes for juices and honey to make it easier to measure your ingredients. Yeast alcohol tolerance is now taken into account so you can accurately estimate final gravity for high gravity meads and wines. You can build water profiles in the recipe builder now using the new Water tab. If you add Gypsum to your ingredient list for the mash, it will show up here and adjust the mash water profile. Additions are separated so you can do separate mash and sparge profile adjustments if you like, and you can even “blend” base water profiles right in the recipe builder if you are diluting with RO water or using a mixed water source. The tool also includes a separate dialog to Match a Target Profile so you can adjust both mash and sparge water to match a given target water profile, and BeerSmith will insert the salts needed right into your ingredient list. We took the same approach with regards to mash pH adjustment. The mash pH estimation tool on the Mash tab now uses the water profile from the in recipe water profiler so it reflects your actual water and salt additions. 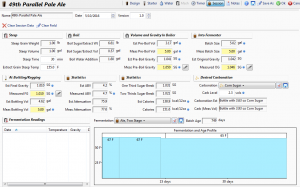 It also takes into account any lactic, phosphoric or acid malt ingredients you have in your recipe and provides both an unadjusted and adjusted mash pH estimate, so you can estimate the pH up front and include your acid additions in the ingredient list. In addition there is still a section for final mash pH adjustment based on a pH measurement, so you can still take a pH measurement and the software will calculate how much additional acid you might need to get to your target pH. This can be useful if your mash pH comes in a little higher than your prediction. With many serious brewers focused on IPAs and the use of large amounts of whirlpool hops, we’ve enhanced BeerSmith 3 to use a temperature based whirlpool hop utilization model. You can now enter a steep temperature for each whirlpool addition potentially allowing multiple hop additions in the whirlpool at different temperatures. In addition the model for carrying unused bitterness from boil hops forward has been enhanced. 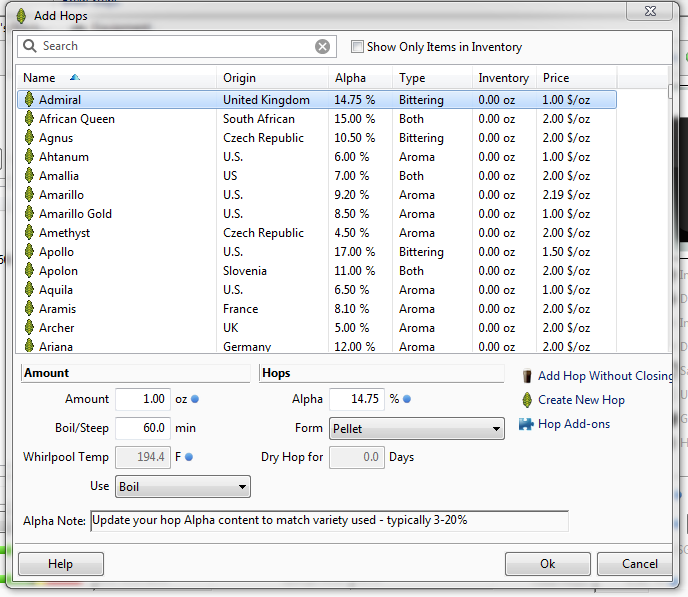 BeerSmith will calculate the hop utilization by temperature and time and give you the correct bitterness (IBU) level for that addition. You can carry forward unused hop bitterness from the boil into the whirlpool by checking the Estimate Boil Hop Util in Whirlpool box in your equipment profile and setting your total whirlpool time there. Individual steep/whirlpool hop additions now have a temperature and time field so you can accurately get bitterness for those as well. When brewing at high altitude the boiling point of water is lower, which also means that hop utilization is lower. This can turn an IPA recipe into a low hop Pale Ale if you are not careful. 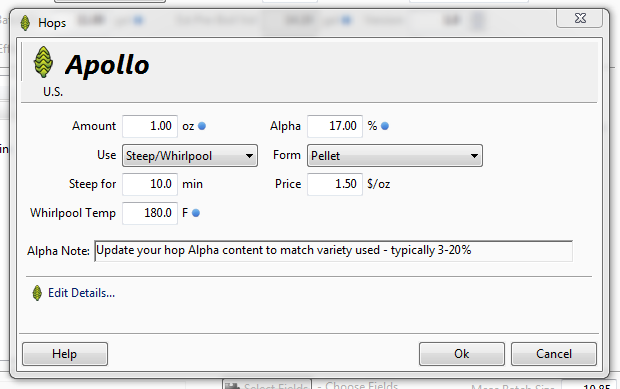 BeerSmith 3 has a Boil Elevation field in the equipment profile which is used to estimate the lower boiling point and hop utilization in the boil, so all you need to do is set that field once and formulate your recipe. 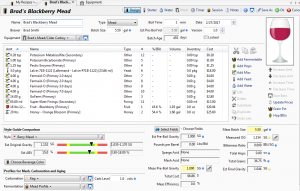 The yeast starter tab now shows options for a two stage yeast starter for those looking to save a little money on liquid yeast, and also has yeast hydration options for dry yeast. The session tab, introduced in 2.3 has been substantially revised to make it easier to record session data while you brew. There are pop up buttons to enter refractometer readings for each gravity field now for example. Fermentation readings have been cleaned up and now default to today. Most importantly the session data fields are now customized to the type of recipe you are brewing. So if you are an extract brewer they will show important extract data like the total amount of grain you are steeping, steep temeratures, the total volume occupied by your extracts and sugars, and how much water you need to add to the extract when boiling. Similarly views are customized for wine, mead, cider and all grain brewing. A lot of brewers wanted to put their recipes in one place and be able to access them from all their mobile devices and computers. While the BeerSmith cloud feature was intended to help do that, there was previously no good way to organize your cloud recipes and many users did not have enough cloud space. With version 3, I’ve added cloud folders to your cloud account so you can organize your cloud based recipes and keep your brew log or other data online. New “Move to folder” and “Copy to Folder” buttons let you copy entire folders to the cloud if needed. Also most of the new license packages include cloud space with them making it possible to store most if not all of your data online. Rating and sharing online recipes was another area I’ve worked to improve. You can now rate cloud recipes right from BeerSmith, making it easier for the crowd to mark the best recipes. There is also a new sharing option. Previously all recipes could only be private or shared (public). BeerSmith 3 adds a new option which is “unlisted” so you can share a recipe with your friend but not have it show up in the public search engine. So you can now mark a recipe “unlisted” and only other brewers that know the recipe id or direct link to the recipe can find it. Finally, security is always a concern. BeerSmith 3 uses a SSL (TLS 1.2) connection to the server now, so your recipe data and passwords can’t be intercepted. Both the desktop and mobile versions exclusively use secure connections so your data is safe. For BeerSmith 3, I walked through every single table and updated entries, added new ingredients, and updated the profiles. The old confusing equipment profile names were replaced with the most common batch sizes for beer, mead, wine and cider and updated. Mash profiles have been added for RIMS/HERMS systems. Basic fruits and juices were added along with cider apple varieties. Dozens of new hop varieties have been added including Cryo hops, hop powders, and hop extracts. Carbonation profiles were updated. 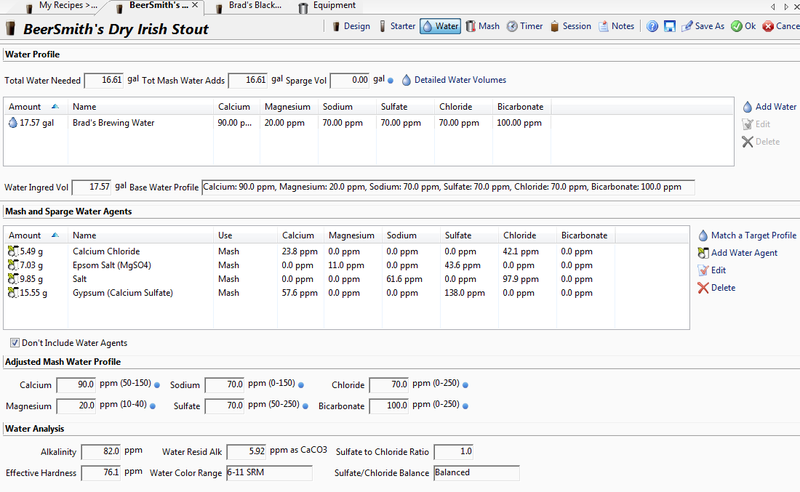 Water profiles for various popular beer styles are also installed by default. Along with that the latest BJCP mead and cider style guides are installed along with a complete wine style guide including detailed descriptions of dozens of popular wine styles. Many dozens of misc items have been added to support modern beer brewing, as well as mead, wine and cider making. New yeast strains were added and the alcohol tolerance levels were added and updated for the most popular yeast strains. In addition there are new add-ons to support beer, mead, wine and cider including, for example, malolactic yeast strains, fruits, purees, and more. As mentioned above all of the data is more accessible now – since you can download new add-ons right from the add-ingredient dialog. Add-ons are organized by type making it much easier to manage them, and a new side-by-side add-on dialog shows available and installed add-ons so you can clearly see which ones are installed on your machine. I spent a lot of time adding additional data checks up front to prevent some of the most common issues like moving the Documents/BeerSmith3 data around accidentally. Automatic backups were moved to a separate area to make recovery easier, and features like the recipe archive have been moved to the top toolbar to make them more accessible. BeerSmith 3 also corrects many bugs from BeerSmith 2 including those affecting mash temperatures, final gravity estimation, mash pH, hop utilization, and also a ton of lot interface issues. BeerSmith 3 uses a new online license and activation system tied to your cloud account. This makes it much easier to automatically renew licenses, easier to manage and deactivate old devices and also cuts down on piracy (some keys from BeerSmith 2 had almost 300 activation attempts!). The licensing options are explained in detail here. When you purchase a license directly from BeerSmith.com, your license will be automatically installed in your cloud account profile. We’ll also have the option for gift codes you can get from third party vendors and use to install or renew your license on your account. To activate your software you start the activation in your software, then log into your online account to tie the license to the activation. You can also manage your license and deactivate devices from your online account. I hope many brewers as well as mead, wine and cider makers will find the new features in BeerSmith useful for years to come! I love Beersmith and I am excited to purchase v3! However, I HATE paypal and DO NOT want to open an account with them just to make this purchase!!! Is there any other way you can take credit card payments? HELP from a frustrated wanna be buyer! There is an alternate order link via FastSpring available on the main BeerSmith order page now for those who do not want to use paypal. I just downloaded BeerSmith 3 and I like it so far. I was wondering though, if you can add the whirlpool hop addition temp to the printout so it would be easier to look at it instead of opening the software to remember what temp the additions were at? That will absolutely be coming in the first patch which will be out within a week. I’ve already made the change and I’m just waiting to see if there are a few other bugs that pop up before I release it. I’ve got our pro account setup, so my brewers can do recipe creation on their own PCs on our account remotely if they wish. I’m guessing that, if we record our physical inventory in BeerSmith on one PC it won’t synchronize the inventory across registered installs on the same account, correct? Is there a good workaround to load in inventories to other copies of BeerSmith we have so all our users know how much stock we have of each ingredient for par ordering when needed? I’m looking at the new features in BS3, in particular the Wine recipe builder. I see that when choosing ‘Wine’ as the style type the buttons to right – Add Fermentables etc. still show beer-related ingredients. I thought the view would change depending on style, or am I missing something? Hi Brad, congratulations on the release of BS3. I am enjoying the improvements. I have a question regarding the water integration. If I include a certain volume of water in the recipe ‘design’ tab it ports this info across to the ‘water profile’ of the ‘water’ tab, which makes sense. I then can use the ‘match a target profile’ to determine the salt additions to achieve a particular water profile. So far so good. However in the next section that provides the ion concentrations ‘adjusted water profile’ it doesn’t use the volume of water specified ‘water profile’ above it, but seems to use the water volume from the ‘mash’ tab. I think this could be confusing and for me isn’t intuitive. If I adjust the amount of water in the recipe design’ tab or ‘water profile’ and leave the salt additions unchanged, then I would expect the ion concentration to change but they don’t. Can the water volumes in the recipe ‘design’, ‘water’ and ‘mash’ tab be better integrated? Just downloaded 3. I was impressed with the quick install and it’s ability to find my 2 version folder (which I moved to another location). I’m brewing today and immediately loaded my recipe up, when I noticed my mash water volume changed. Version 2 called for 5.76 gallons. But, Version 3 says 5.55g!?? Will investigate further to see where the difference is. I’m liking the new layouts. Brad, small request, but the print function is a bit dated and inhibits Windows 10 from printing 2-sided. Would be nice if, in your next patch, you update this component. I was wondering if we would ever see a possible release for older OS X builds? Just curious if you are developing a Linux build for Beersmith 3 that will run on the ARM architecture for Raspberry Pi? Steve RE: PayPal. You should be able to pay with a credit card through PayPal without having a PayPal account. I’ve done it in the past and it’s basically how the card swiper works. To recieve money you need an account to pay you don’t. I can’t seem to find the sync button on the cloud tab for Beersmith 3. First – Thank you for such an awesome program and was very happy to continue supporting you and your product with the new subscription licensing. If there is anything I’d change it would be to reset the recipe layout back the way it was in BeerSmith 2. Let me explain as it maybe me and I may simply be missing something but in BeerSmith 2 my recipes would list from top to bottom, Water profile and addtions, Grains, adjucts, extracts and the hops based on when they were added. Such as 90 minute additions first and whirlpool last with dry hopping last. Sadly it is all over the place now and I can figure out how to force it to resort the way it appeared to be by default in Beer Smith 2. I am dissatisfied with v3.0. There is a bug on the edit form that will not allow me to change equipment profiles for the recipe. Instead it allows me to select batch type… the record source for your combobox is not populating properly. I have a screenshot but no way to share with you. Updated the mobile app from V2 and all the IBU calcareous on my existing recipes are way, way over, I’d say 60% more. I had a beer that was around 80 IBU’s that is now 141. All 20+ recipes stored are impacted. Is there a way to fix? Previous post: BeerSmith 3 – Pricing and Preorder Discount Open Now!